Google Tag assistant is an awesome plugin that helps to troubleshoot installation of various Google tags including Google Analytics, Google Tag Manager and more. For large websites that gets updated frequently, we need a simpler solution to verify if the various analytics codes are working correctly. With Tag Assistant, it becomes super easy. You only need to navigate to a webpage and click on Tag Manager. It will report any errors and suggest improvements to the implementation. The below screenshot displays the tag analysis of the popular online shopping portal Flipkart. The Tag assistant correctly identifies the different tags detected on the home page namely GA and Remarketing tags. Content is the currency of the web. Content that provides high value to the visitors often brings in the maximum revenue. Here, I am talking about those websites where content plays a key role in conversions. The biggest problem that marketers face is how to measure the value of content and group them together to see which piece of content has generated the maximum revenue and vice versa. This might help them to focus more or have an increased budget for those types of content that brings in more visitors or for those content that helps to engage the visitors more ultimately adding to the brand value and conversions. PageViews - Pageviews is the total number of pages viewed. Repeated views of a single page gets counted. Unique PageViews - Unique Pageviews is the number of visits during which the specified page was viewed at least once. A unique pageview is counted for each page URL + page Title combination. Average Time on Page - The average amount of time users spent viewing a specified page or screen, or set of pages or screens. Bounce Rate - Bounce Rate is the percentage of single-page visits (i.e. visits in which the person left your site from the entrance page without interacting with the page). Exit Rate - %Exit is (number of exits) / (number of pageviews) for the page or set of pages. It indicates how often users exit from that page or set of pages when they view the page(s). 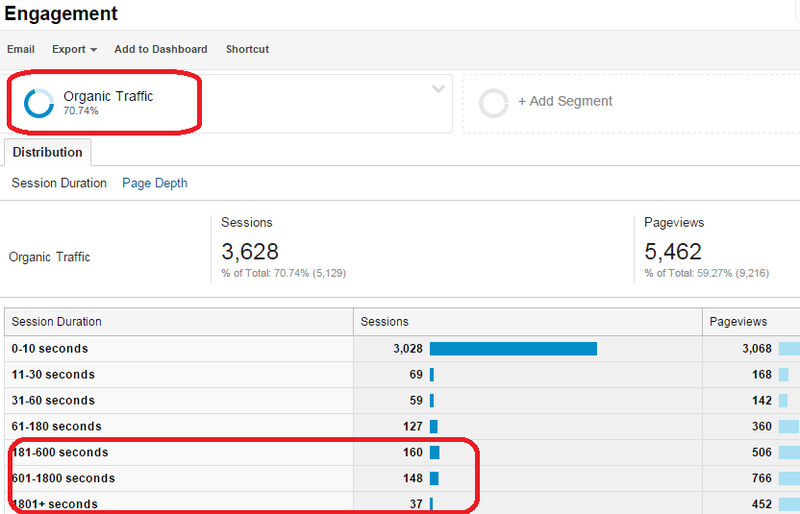 This report shows how many visits lasted each length of time shown under the session duration column. The second column shows how many pageviews each session duration delivered. Now, let's take an example, suppose I have a website where I am selling slimming belts and I also have a resource section where I have a list of webpages having content that educates people about the benefits of weight loss. I want to find out how many people are actually liking the content. I already have the information that people who spend more than 4 minutes on my site gets converted more often and now I want to find out how many sessions I am able to generate that consists of more than 4 minutes using organic traffic only. I will straightaway head over to the engagement view and filter organic sessions using the advance segment. This will help me to determine how many sessions are my content being able to generate that can deliver maximum conversions using the organic channels. Keeping the advanced segments for organic traffic on, I am able to view the top pages on my site that are generating maximum views. I also keep an eye on the bounce rate and exit rate of the site. 1- The page URL's that are generating the maximum pageviews with the minimum bounce rate. 2- Page URL's generating the maximum time on page. 3- Page URL's generating the maximum number of unique pageviews. 4- Page URL's leading to maximum number of exits. This report helps to see the percentage of drop offs that are being generated from the starting pages or the 1st interaction or the 2nd interaction pages. Have a look at the below report for my blog where I am able to see where exactly do people tend to drop off from my website. This visual representation of top pages of my site on which the audience interacts the most helps to give me an idea as to where should I exactly focus my attention. This report helps me to analyze which are those URL's that are helping me to generate the maximum conversions. Please keep the organic channel filtering on because this will display only those conversions that have happened using the organic medium. The report can easily indicate the top value pages on my website and gives me an idea on what genre of content I must produce on a regular basis in order to keep on increasing my revenue. 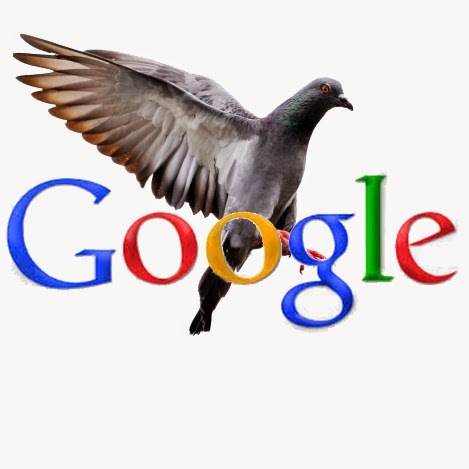 Another major roll out for Google Pigeon update has taken place. This time, the update has extended beyond USA to all the English speaking locales like UK, Canada, Australia etc. Indians however have to wait for some more time because this update has yet not been rolled out in India. The Pigeon update has been aimed at providing a more useful, relevant and accurate local search results linking them closely to traditional web search ranking signals. It was reported that some big brands have lost 5-10% of their organic traffic post-Pigeon. 6- Relevancy of Google My Business Page and careful linking of Google My Business Page with the main site URL. People react differently, some might directly visit a physical store to purchase items while some might browse online before selecting a store. This relationship between physical and online world is measured effectively by a new metric in Adwords known as the "Store Visits". This metric will let the advertisers know the percentage of in store visits that are driven by Google ads. More than 95% of sales happen through offline stores but online activity influences the purchase behavior happening on these stores. The brands need to have a subtle presence felt online in order to drive traffic and conversions to their offline stores. AdWords provides you insights as to how your ads influence new conversion types, such as phone calls, store visits and conversions that are completed after a customer uses more than one device or browser. A customer might locate your ad on a smartphone while traveling but he might make a purchase after he reaches home, this time using a browser. Here, the customer is using more than one device to complete a purchase. Similarly, any customer might see an ad on her mobile phone while locating a store in her area and might visit that store shortly making a purchase by physically visiting the store instead of purchasing it online. Such physical store purchases get missed and are not attributed to adwords. This new metric helps the advertisers to actually find out how many percentage of people are visiting their physical stores after seeing an ad online. The Estimated Total Conversions column displays the estimated conversion types, such as cross-device conversions or call conversions from ads shown on tablets and computers. Screenshot displaying the estimated total conversions column. Please note: You need to have conversion tracking enabled to get this data. How "Store Visits" Metric Might Help? PetSmart, one of the leading retailer of pet supplies, uses store visits data to improve its customer shopping experience. 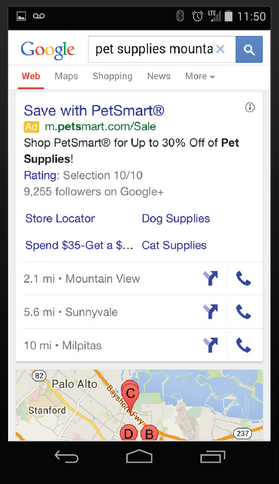 Based on the insights, gained via store visits metric, it has been estimated that 10-18% of clicks on search ads lead to a store visit, PetSmart is now investing more in ads with an increased use of location extensions to show maps and directions to help people find nearby stores when they are searching for products like puppy treats or aquariums. Currently, only selected advertisers in US have been given access to this metric. In the recent months, we can assume this data to be made available to a larger percentage of advertisers. You need to contact Google representatives in order to identify whether your business qualifies for this data or not. Google Can Now Control Your Room Temperature! Imagine you are out on a flight on a chilly Sunday night and feeling really cold. When you reach home, you find the room temperature to be warm and comfortable. There wasn't anyone in your room but still the room temperature became just perfect. How was that possible? Well, in a recent great technological adaption, Google along with its partnership with NEST can now control the room temperatures of your house. You only need to say "Okay Google, Set my Nest to 25 degrees" from your phone and it will be done! From cold to hot or from hot to cold, you now have the power to control the temperature of your house with your wireless device. 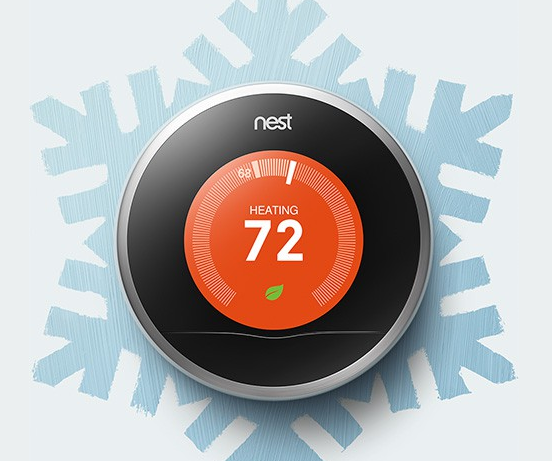 Setting the right temperature at the right time is easy with Google and Nest. All you need is a Nest Thermostat and the Google app on Android or iOS. When you’re on your way home, Google will work with Nest to pre heat or cool your home to your preferred temperature. You'll also get a Now card to tell you what is happening. How Different Marketing Channels Affect Online Purchase Decisions? Check Yourself! Google offers a free tool to compare the different channels of digital marketing that helps to generate conversions. For business owners, the ultimate destination is a sale and Google Analytics offers excellent custom tagging options that helps such business owners to identify the channels that are generating the maximum revenue. But, what if we need to find out which channels offers the maximum conversion possibilities based on specific industry and country? This will require big data processing for which we might not have sufficient resources. Now, this problem of big data analysis is resolved with Google offering a free "Customer Journey to Online Purchase" tool that helps to understand the roles these channels play, so you can better plan which channels you will use when, increasing marketing performance. This tool is really helpful in accessing how digital marketing channels influence a typical buyer before the sale. Global Ranking Score and On Site Ranking Score - How Google Might Determine Responsive Search Results? A global ranking score is computed for web documents/objects responsive to the search query, wherein each web object includes at least one web page from a cluster of web pages of corresponding websites. Implementations can include any or all of the following features. The global ranking score for a particular website is computed based on data identified without reading information from the particular website. The score is determined based on both off site and on site data. Global ranking score computation includes calculation of off site data like number of links to a web page or website from other unrelated websites, the number of times users have selected the web page or website in search results responsive to a particular query, or other statistical data providing information regarding the relevance or authority of a particular website associated with the web object. Onsite data may include data based on the number of keywords on the web page or website responsive to the search query, the location of the responsive keywords, a number of links to the web page from other web pages having the same domain, and/or the placement of the web page in the structure of the website. Onsite ranking scores are computed for web pages of a particular website in the responsive web objects, wherein computing the onsite ranking score includes evaluating an importance of at least one web page relative to other web pages within the particular website. Consider the scenario when more than 1 pages of a similar website competes together to rank for a particular search query then in such cases, the on site ranking score is computed and only the best result/object from among a cluster of results from similar domain is identified and displayed before the user. Step 2 - Global ranking scores are computed. Step 3 - Onsite ranking scores for webpages of a particular website are computed. 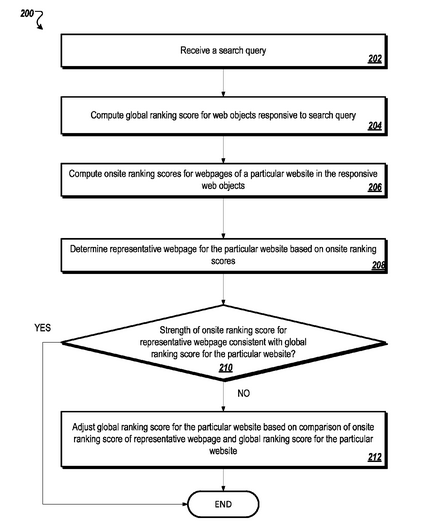 Step 4 - Identifying representative webpages of particular website based on onsite ranking scores. Step 5 - Compare the strength of onsite ranking score Vs global ranking score. If the scores are consistent the program ends else the global ranking score of that particular website is adjusted based on the comparison of onsite ranking score. We are approaching 2015, a year that is seen as a big challenge for digital marketers. Industry gurus have already begun giving predictions as to how brands can gain more ROI by targeting the right audience at the right time and using the right channels. My own opinion rests with SEGMENTATION, I strongly believe, the best way to define your digital marketing strategy in order to generate the maximum pull is by applying the right mix of segmenting your audience using the right tools and criteria. Audience segmentation in 2015 will be the key to generate the best of the revenue. Be it in the context of multi-channel marketing, customer segmentation is one of the most important but underlooked aspects of digital marketing strategy. Dividing your customers into small groups based on some criteria so that targeting such refined group of audiences gives you the maximum return on investment. Segmentation can be sometimes simple but better segmentation often is a difficult job. It should be done on the basis of company policies and must always target the most profitable customers. Value - Determines the worth of the customer in monetary terms. Demographics - These normally include age and gender. Behavior - This studies the behavior of the customer, like how often do they check their mails, tweet, like or comment. Lifestyle - This includes determining the shopping pattern of the customer, the net income, the location etc. Think Before You Get Overjoyed! I have seen many marketers wrongly assume that their core customer base is actually the set of people that are converting profitably in an excel sheet. We marketers always have this tendency to manipulate reports to highlight the best achievements and while doing so, we end up segmenting our core customers into profitable and non-profitable. It is therefore important to adjust your criteria each time you play with data. 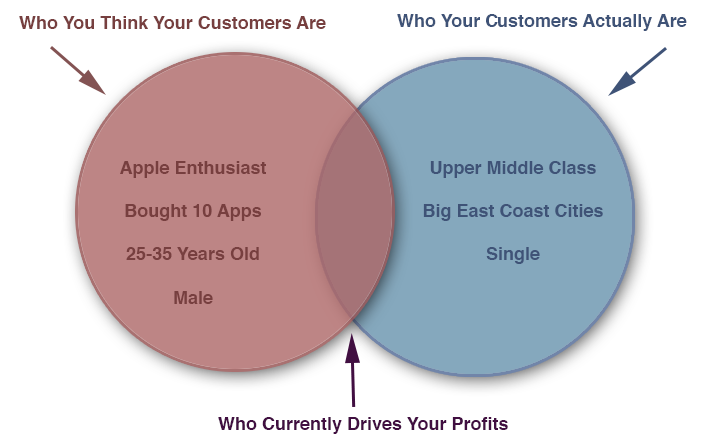 The Adobe Digital Marketing blog has an amazing comparison of proper customer segmentation. In the below diagram we can actually see that the marketers often get confused when it comes to define the actual audience generating the profits. No matter whether it comes to choosing a particular digital marketing channel for a specified set of audience to choosing a specific banner to woo a specified set of customers, marketing efforts that are segmented tend to generate more faster and better results when compared to the ones that are just based on a hit and gain strategy. 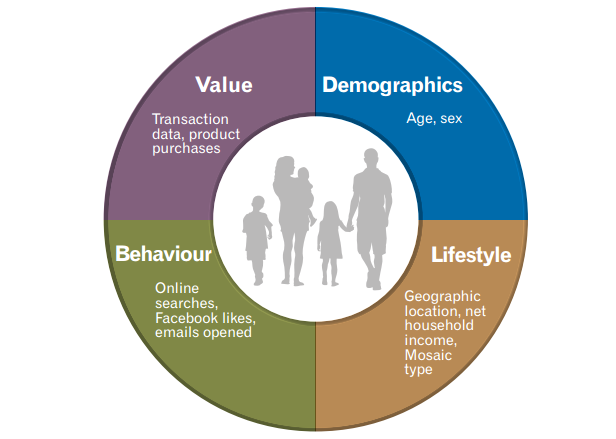 Do you think customer segmentation in Digital Marketing has a greater role to play in 2015 and the years ahead? Please let me know in your comments below. In a country like India where a lot of people still use Feature Phone, this makes sense for Google to detect the content differently for Smartphone users and Featured phone users respectively. A Smartphone is a high end phone while a Featured Phone is a low end phone. In order to better server the users and to solve the compatibility issues, Google uses 2 different bots namely the Smartphone bot and the Featured bot to crawl content available on these device differently. It is suggested to offer a responsive website for Smartphone users because they have high end devices for adjusting screen sizes accordingly while for the Featured phone users, it is recommend to have a separate mobile site like present on a subdomain - m.examplesite.com that has been specifically created to serve the Featured phone users. Who else wants to do some amazing things with the help of Google Analytics but does not know how to do that? Yes, Google offers some amazing capabilities via its analytics platform but often the webmasters find it difficult to implement custom data arrangement via analytics. Keeping this in view, Google has launched a FREE resource - Google Analytics Demos and Tools that will guide you to take full advantage of the flexibility and power of Google Analytics. It's a useful resource for users and developers to discover what's possible with the Google Analytics Platform. This information was provided by Philip Walton, Developer Programs Engineer, Google and published on the Analytics official blog. Work with demos using actual GA data. Use these demos as a reference for your own implementation. work with interactive elements that provide full code snippets. You can make use of various tools to showcase how Google Analytics can be extended with custom solutions. Tools are targeted at real-world use cases and solutions. You can access advanced GA features without any technical help. Google is set to display "Mobile Friendly" labels to its mobile search results. In order to boost the mobile user experience of searchers, Google will add a small label just before the meta description tag that will let the user know whether that website is mobile friendly or not. How to Make Your Website Eligible For The Mobile Friendly Label? Mobile Friendly Test - With the help of this tool, you can test whether any webpage URL has a mobile friendly design or not. Creating Mobile Friendly Websites - A Comprehensive Guide - Find step by step guide to create smartphone optimized websites. How to Get Rid of Faulty Redirects? - Faulty 301 redirects annoy the users. Read on how you can get rid of these redirects. 25 Principles of Mobile Site Design - A detailed tutorial on how to increase conversions for a mobile optimized website. Who else wants to find out on which keywords does your competitor rank on Google? SEMRush and Alexa are the main tools that every SEO uses whenever they wish to find out the organic keywords on which their competitors are ranking. However, both SemRush and Alexa are paid. One of the newest competitor to both of these tools that is completely FREE to use is WebSignals. Excited? Let's learn something more about it. Organic Keywords - Displays the current ranking of keywords along with the change. Organic Competitors - Displays the organic competitors for the searched site along with the change in rank. Up Keywords - Shows organic keywords that have improved in rankings. Down Keywords - Shows organic keywords that have declined in rankings. New Keywords - Shows organic keywords on which the site has recently improved the maximum in terms of rankings. Deleted Keywords - Shows organic keywords on which the site has recently declined the maximum in terms of rankings. I simply like this tool and the best part is, it is easy to use and returns result super fast. It does not costs a buck so beginner level SEO's should definitely give this a try. Let me know your feedback on this tool. Happy Analyzing. Which Seo Tools Do You Prefer? Google Mobile App Analytics Fundamentals Course Opens on Nov. 18th - Register Today! If you are into the field of app development or marketing then this course is certainly for you. The Mobile App Analytics Fundamentals course will teach you about the basic concepts of measuring user behaviour for your mobile app. The course instructor will be Fontaine Foxworth. Don't confuse these with Rich snippets, Structured Snippets is a new feature that incorporates facts into individual result snippets in Web Search. It helps to extract and understand tabular data on the Web and displays particularly relevant data to users. Google uses machine learning techniques to identify data tables on a web page as it has special functions to ignore other forms of tables like the ones used to format web pages. Further, the table data is filtered with the help of additional algorithms to determine quality and relevance based on the search queries. As we enter the search query, the first result returned by Google is of Wikipedia. Now, notice 3 additional pieces of texts in the search snippet apart from the general snippet. This additional snippet consisting of the above information is a structured snippet whose information has been obtained by the right hand side table displayed in the Superman Wikipedia page. Having structured snippets in the search results can surely help to boost CTR. So, addition of tables in the content that serves to enhance the relevancy and accuracy of the facts might get picked up by Google and displayed in the search results in the form of structured snippets. So folks, it's time to include tables within your content to unleash the power of structured snippets. How to Fix Disapproved Ads in PPC? 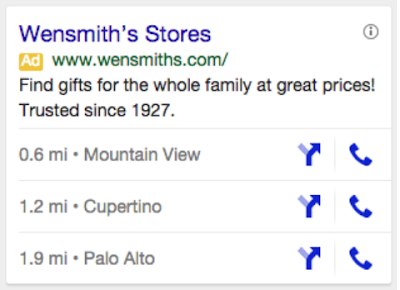 Google has made an update in mobile search ads location extensions. Now any advertiser having several local business locations can display upto 3 different business locations making it easier for the audiences to choose the location that's most preferable to them. This improvement offers consumers the flexibility to choose which location to visit, directly from your ad. Your ad can show the street address for each of your locations or the city and proximity to the consumer — depending on each person’s location settings. The ads with location extensions will include links to get directions and make a call. In the above screenshot, the advertiser is displaying 3 different locations under a single ad. Advertisers serving location extensions are now automatically enabled to show their ads as a single location or in groups of 2 or 3. In order to allow advertisers managing more than one Adwords account to view all the essential advertising performance data like (Impressions, Clicks, CPC, etc.) and GA metrics (bounce rate, time-on-site, % new users, etc.). in one Google Analytics property, Google has added a new Accounts reporting column in the Adwords reporting section of Google Analytics. This report will allow the advertisers to see their aggregated Acquisition, Behavior and Conversion metrics for each account on a single row. 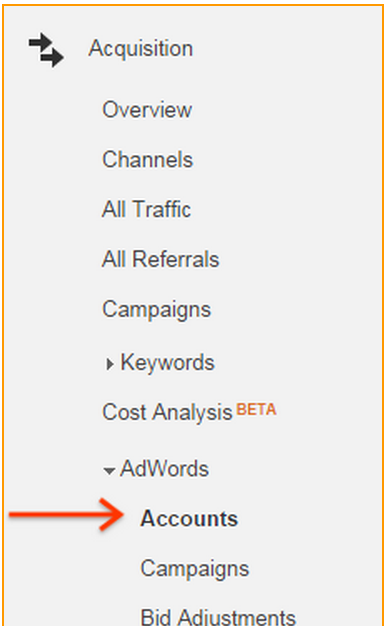 You can further click on any account to see the performance of campaigns contained in those accounts. 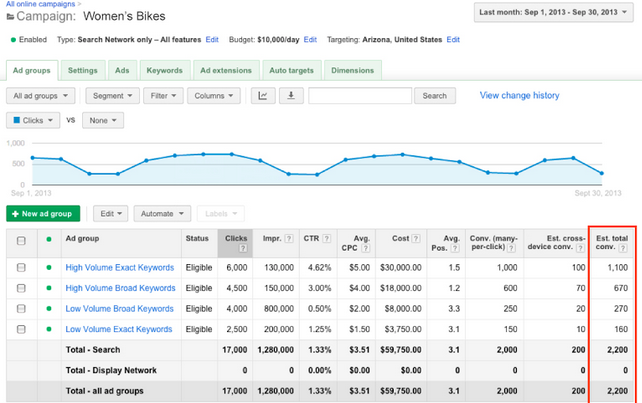 Please Note: This report is only visible if you have more than one Adwords account linked to your analytics property. Content is an integral part of search engine optimization. The web is made of tons of content which Google crawls on a daily basis. Some types of content is penalized by Panda while others are rewarded highly. As such, content writers and copywriters have a major role to play in getting good search engine rankings. Here are 7 types of content which every content writer must avoid writing. If we search on Google with the query "filler content", we get the site http://www.lipsum.com/ that is the home for dummy text. What does this mean? This simply means, filler content is such content that simply serves the same purpose as a dummy text adding no value and uniqueness to the main article. Content that is insufficient, inconsistent and lacking something is termed as patchy content. Sometimes, starts are good but writers ignore to keep the flow of the article in the middle paragraphs. Again, the concluding part is well written. Writers should ignore writing patchy content and must create content pieces that maintain its flow throughout the article. "Mercedez Benz Cars is one of the popular car models of this world. Mercedez Benz Cars are costlier and require too much fuel to run. Mercedez Benz Cars are often used as a racing car. If you would like to buy a Mercedez Benz Car then please contact dealers of Mercedez Benz Cars." In such a short para, the keyword "Mercedez Benz Cars" is repeated 5 times. This is an example of stuffed content. Writers should avoid writing such content. Duplicate content is also known as scraped content. Quality content is known for its uniqueness. Content that lacks quality often is a scraped copy of some other article. Writers often write new content based on some references. 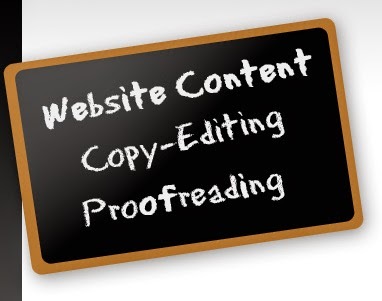 Some create new content that is a copy of content already existing on the web. Creating such duplicate articles that do not help the end user is a sheer waste of time and money both. Does the user take action after reading your content? If not then your content is not actionable. It is very important for a writer to determine the purpose of writing content and what action does he/she wants the reader to take after reading the article. Some writers may want the audience to feel motivated, some will want them to smile, some will want them to feel emotional, some will want them to purchase some products etc. So before writing your content, take some time to ask yourself, what actions or emotions do you want your audience to take? Content created around outdated news and stuff are known as stale content. Writers should avoid writing stale content and must carefully choose the topics before planning their stuff. Any content that lacks sufficient references and research might appear inaccurate. Suppose you wish to write a content related to Penguin update and don't know the recent update was Penguin 3.0. You accidentally mention the update Penguin 2.0 as the most recent update. Then, mistakenly you are writing inaccurate content. How to Write Content That is Loved by People As Well As Search Engines? 1- Plan your writing. First write down the outlines and its main purpose. 3- Use Google Keyword Planner and Google Trends to find out search queries that the user would most probably type when looking for your content. 4- Create a catchy title that persuades the user to read the entire article. 5- Make each paragraph solve a particular purpose. There shouldn't be any filler paragraphs. Every paragraph must serve a well-defined purpose. 6- There should not be any spelling or grammar mistakes. 7- Information should be accurate and fresh. 8- Facts should be accompanied by proper references wherever possible. 9- Same words should not be repeated again and again. Instead, synonyms should be used. 10- The content should be unique and must provide some actionable advice. If you know of any other techniques that I have missed then please share in comments below.